Over the past year or so, Google has pushed some major changes in the form of an algorithmic update called Penguin (and just before it, another called Panda) that had a pretty single-minded purpose; to draw a line in the sand and call everything on the wrong side of the line ‘black’. Penguin actually changed almost nothing about the rules of good website marketing (though Panda did) — Penguin’s (very nearly) single purpose was to punish specific kinds of link-building behavior. Has anchor text that is an exact match to the anchor text in the majority of your incoming links, particularly if the content that is linking is low-quality content. The link comes from an auto-approve, non-moderated blog — again, particularly if the content on that blog is of lower-than-average quality. Site directories that few people use (i.e. a lot of them)? Useless. now you must spread your keywords around on every page or you’re flirting with the Google sandbox. What is an Infographic? An infographic is a pictorial representation of specific data or knowledge. Infographics can be a great way to showcase information on a particular subject area and can prove to be a good source of link value. Infographics have the ability to transform plain material into interesting and exciting web content. Over the past few years the value of infographics has grown tremendously because many have begun to recognize the potential they have to connect with their target audience. Link value or link juice is a term often used in Search Engine Optimization and refers to the amount of value that the search engines like Google attribute to a website or link. Link juice is assigned to web pages and is dispersed throughout a website based on how well your website is optimized. The more links and most importantly the more high quality links a website has directly translates into the more link juice a website is likely to have. When talking about Links it is important to understand some important fundamentals. Total links quantity indicates the total number of links that your website or webpage possesses. The merit of these links can vary which brings us to the linking source. The linking source describes who is linking to your content and how credible or trustworthy they are. The sites that have a higher rank will pass on more value than those with a lower web rank. Even though the websites with a higher rank may provide more value it is also important to have diversity among your links. It’s ok to have links from lower ranked pages as long as there is a balance between link values. One of the most important elements of creating a website is selecting a proper domain name. A domain name is commonly part of a larger Internet address called a “URL”. Having the right domain name for your website can significantly help establish an online reputation and generate greater visibility. Domain names give both the human visitors as well as the search engines the first description or impression of the website. Choosing a domain name can often be just as important as deciding the name of your business and should not be taken lightly. Finding a successful domain name will require time, patience, and creativity. The following tips are designed to assist in creating successful domain names. A domain name is one of the first elements of a website that visitors see. Matching your domain with your company name will help target your existing as well as potential customers. Having a company and domain that describes your website will also let people know what the website is about and draw in targeted traffic. For example with the domain www.DeliciousPastries.com Delicious Pastries is the company name, website name, domain name, and also highlights Pastries a major descriptive keyword. There are several incentives for keeping your Domain name short which include it being easy to type, easy to remember, and easier to travel by word of mouth. A domain name that is longer than 3 words should use hyphens. However a domain name with more than 3 words and hyphens will raise the websites level of spamminess. Having a keyword in your domain name will help rank not only because it is part of your domain but also because it is the anchor text that others will use to link back to your website. One of the most important and easiest Search Engine Optimization concepts is keyword placement. SEO Keyword placement refers to the integration of targeted keywords into locations on and off the webpage. Keywords or key phrases are generated to represent the terms that users search for when trying to locate your company and website. A website using the wrong or inaccurate keywords is as equally bad as a website that ignores keywords all together. Having accurate and descriptive keywords however is only the first part of the equation. Once you establish a list of relevant keywords they then need to be strategically placed throughout the website in order to increase traffic. 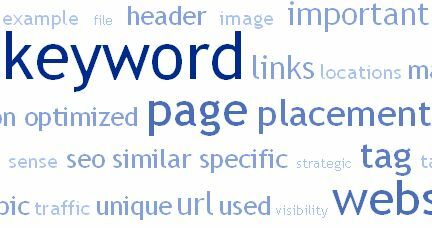 Each individual page of your website should be optimized for one to three unique keywords. Selecting keywords along with the placement of these keywords is crucial in order to increase your website’s visibility and guide targeted traffic directly to your website. Below are the 10 most important positions to consider when performing keyword placement. It is recommended that you always place your keywords near the beginning of the title tag. Not using your keywords in the website’s title tag can make it extremely difficult to rank for your targeted keywords. Keyword placement in the title tag is thought to be the most important search engine ranking factors, each page title should be unique to that page and optimized for that specific keyword. Although the Meta Description Tag seems to play a very little role in the actual search engine ranking it can still be used to influence potential customers to visit your website. Any keywords that your description tag has in common with the search query will appear bolded in the Search engine results page (SERP). Similar to the title tag each page should also have a unique description tag that targets only 1-2 keywords. Most people can agree that social media has drastically changed the way businesses perform online marketing. Social media sites like Facebook and Twitter have provided businesses with the resources to create detailed portfolios and interact freely with their customers. Some companies even believe that Search Engine Optimization (SEO) is no longer important and social media should be their main focus. Does SEO still matter? Social media sites have done a great job of connecting businesses with customers. However even with all the advantages that social media has to offer it shouldn’t replace SEO. Instead social media websites should be thought of as a complement to SEO rather than its substitute. There are many benefits to using social media like attracting new clients, staying in contact with clients, and the ability to build a positive reputation. It’s clear that due to its popularity social media has begun to push other key SEO elements into the background but that doesn’t mean those elements are not still important. 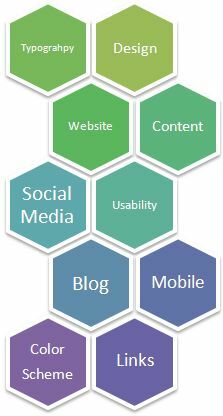 As important as Social media is it remains only one portion of the SEO puzzle. The following is a list of reasons why SEO still matters. 1. SEO Finds The People That Want to Find You! Social networking will put you in front of other social media users but that doesn’t mean they are customers. With SEO you have a better chance of being found by buyers. Social media is often used to communicate with users that are already part of your circle whereas SEO can be used to draw in users to your circle. 2. SEO Provides More Relevance to Customers! Social media can increase awareness of your company but with Search Engine Optimization you can specifically target customers seeking your product or service. SEO helps you rank for relevant searches which increases the chance of conversion. Additionally each keyword can be optimized to target a different group of consumers. 3. 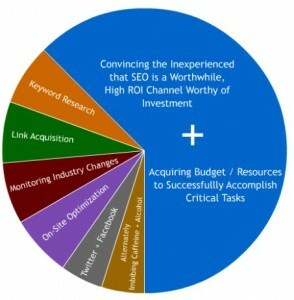 SEO Enhances The Conversion Process! WordPress Plug-Ins That Can Make SEO Much Easier! WordPress is a web-based software that allows users to create and manage websites and blogs. The open source structure enables people from around the world to contribute to and maintain their WordPress website whether on WordPress’ web server or installed on their own web server. Although WordPress initially began as a blog tool it has developed into something so much more. By utilizing plug-ins, widgets, and themes users have the opportunity to fully customize their experience. A plug-in is software that can be added to existing software, like WordPress, which adds a new specific capability to the larger software application. For a full list of WordPress product features visit WordPress Product Features. There are over thirteen thousand plug-ins available for the WordPress software making it extremely easy to tailor it to your specific uses. The following are some useful SEO plug-ins that the WordPress open source community has provided. AddToAny creates a customizable panel that showcases social networking sites. It makes it extremely easy and convenient for a visitor to submit to any social networking sites. The share menu organizes the social media sites according to most visited.